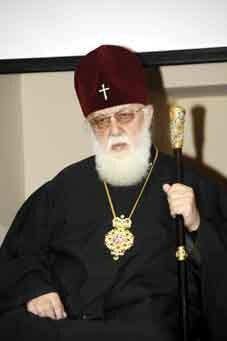 Georgian Patriarch Ilia II plans to visit the Georgian breakaway region of Abkhazia in May. This information, broadcast by the Georgian media on April 7, has already led to a protest from the separatist side. The Abkhazian side states that the Georgian Patriarch’s visit to Abkhazia is “not even discussible.” “The statement about a visit is another provocation, we have not invited him [Ilia II] to Abkhazia,” said the head of the so-called Abkhazian Eparchy Vissarion Aplia. The de facto Abkhazian authorities also doubt the visit will take place, quoting a visa as the main problem the head of the Georgian Church will have if he tries to visit the breakaway region. “It’s not possible for a citizen of this neighbouring state to get an Abkhazian visa because Abkhazia doesn’t have any diplomatic relations with Georgia,” announced a spokesperson for the de facto Abkhazian Foreign Ministry. The announcement of the visit is a further development of the situation in which seven Georgian monks were forced to leave territory controlled by the separatists several days ago, accused of “provocations” and “anti-Abkhazian statements.” Ilia II condemned this forced removal and declared his will to support Georgian monks and priests in Abkhazia. “Abkhazia will never be separated from Georgia,” said the Georgian Patriarch, speaking on April 6. “The Georgian side is now conducting negotiations with the leadership of the Russian Orthodox Church, asking for their mediation, and expects that its position will assist us in making the visit,” said Metropolitan Gerasim, who leads the Foreign Affairs Department of the Georgian Patriarchate. The Georgian side also states that a Patriarchal visit to Abkhazia was the one of the topics of discussion between Ilia II and Russian President Dmitry Medvedev during their meeting in December 2008. Ilia II is famous for his active assistance of the residents of regions damaged in the Russian-Georgian August 2008 conflict. The Georgian church was one of the first organizations to provide humanitarian aid to the population of villages located on the administrative border with South Ossetia and also actively participated in ensuring the exchange of the bodies of soldiers killed during the war. In August 2008, Ilia II visited the Georgian town of Gori and the village of Nikozi, which were still then under the occupation of Russian troops and so called South Ossetian militia, with the assistance of the Russian Church which managed to negotiate with the HQ of the Russian Army.